As you enjoy your Thanksgiving weekend, remember to also enjoy this Sunday’s celebration of Christ – King of the Universe. And you know what comes after? The joyous celebration of Advent is right around the corner! The season of Advent is an ideal time to organize an appeal. It’s a great time to fundraise for two reasons. The first reason is because it is the ‘season of giving.’ December accounts for 29% of all yearly giving. The second reason is because people are expecting to be asked. Therefore, don’t disappoint people, as they enjoy being asked! And more importantly… ask before other charities do. In his Total Consecration to Jesus through Mary, Saint Louis de Montfort asks us to spend at least 12 days emptying ourselves of the spirit of the world. He reminds us that before we can take a step forward, it’s prudent to stop and reflect. Saint Louis shows us how moving from one desire to another (even to do God’s will) has to be with prudence and preparation. This is especially true when asking for money. If an Advent appeal is not properly planned, it can turn into discouragement. What I like to do is set a December campaign goal that is motivating (and a bit discouraging). Then I take several opportunities to reflect and plan how much I want to raise, what I will say, who I will ask, and when I will do each step. Most importantly, I make sure that I’m getting as personal as I can with my approach and that my story is correctly told. I’d like to share a story. I have been reviewing the appeal letter of a religious community. 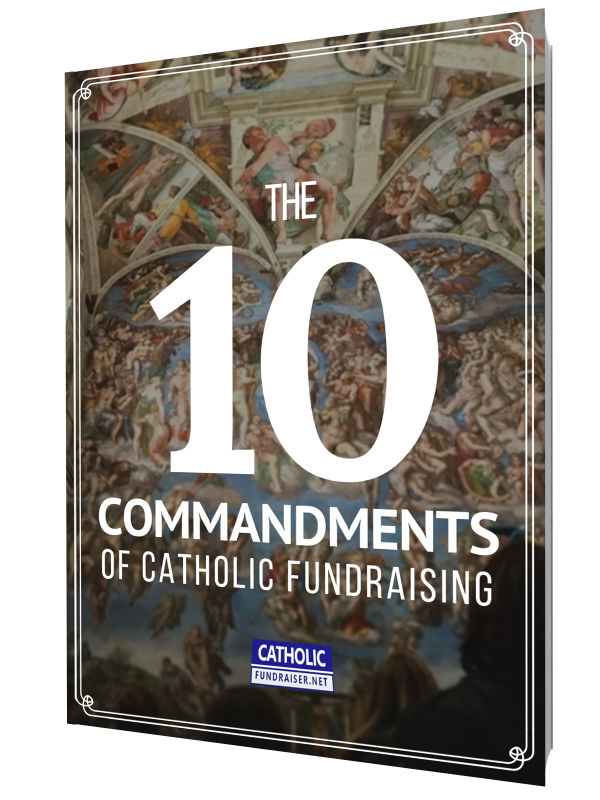 The abbot hadn’t done much with fundraising before, but he knew that if Catholics heard the community’s story, rather than simply ask for a donation, they would give. I recommend you double check that you are telling your story in your own words. Sharing facts and figures about what the money will be used for is important, though don’t forget to share how God has blessed you throughout the year. I like to answer these sorts of questions by finding out how well someone’s considered three essential aspects of Catholic fundraising. I use this same technique when evaluating my own December fundraising. Are you speaking in your own words? Don’t copy and paste what others are doing… Nor should you simply use last year’s appeal letter. Are you personal with your approach? This means going out and speaking to people in person. One-on-one fundraising is always the most successful. More so, it’s the most Catholic way, too! While I know it’s scary to ask for a donation, you will discover how generous and kind people are when you do approach them directly. Remember: the apostles were as scared as you are when it came to asking for support. Does your appeal focus on the right people? You will raise more funds if you focus on a specific group of people. Don’t try and run around everywhere, tiring yourself out. Remember: Advent is a joyous season! You should also spend time with your family and friends! Here is an article that I wrote which outlines how to write an appeal letter… the Catholic way. Also, you will want to check out this article which I offer you 4 recommendations on how to correctly use Bible verses in your appeal letters. As I recommended in Step One, you should be asking a select group of people. This means you have their contact information. Whether that is an address, phone number, or email address, you know how to reach people directly. Therefore, you want to make sure that you follow up with every person that you have asked. While you may think this part is ‘pushy’ it’s not at all. What you are doing is simply confirming each person has received your request. You’ll be surprised how many people don’t actually read your letter or email. This happens because people are running around frantically during the holiday season. In my years of experience, I’ve always found people to be grateful that I’ve followed up with them. This means contacting those who gave to say thank you. I check on those who said they would give, but I haven’t received their gift. Lastly, for every person who has not responded, I double check their decision: whether they can and cannot give. Question: Will you be running an Advent appeal this year?